It is a fine line with salted caramel and one that not everyone can master. We have had some right doozies that have zero salt in or so much salt you could grit your pathways with, and others that have hit the nail right on the head and created something divine (here’s looking at you Superb Salted Peanut Caramel & Lindt Salted Caramel). 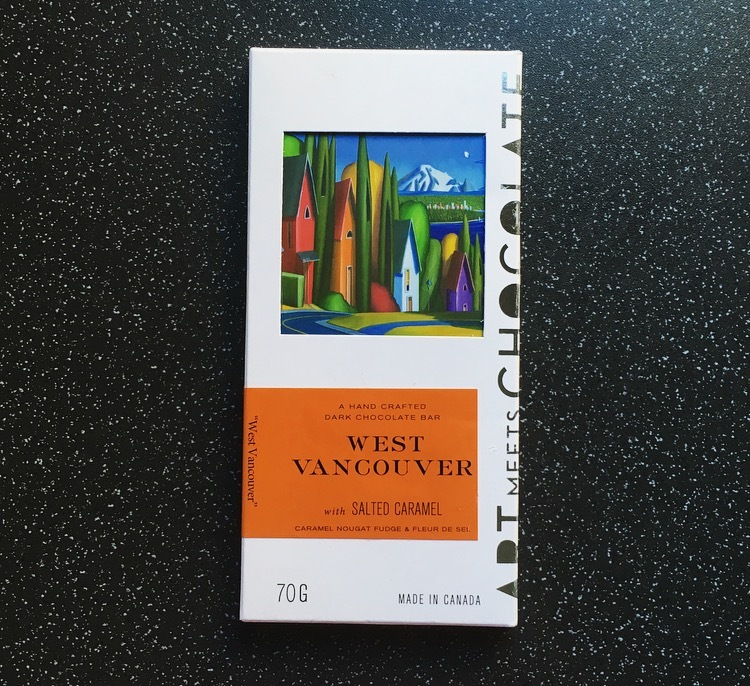 I previously reviewed the Art Meets Chocolate Gastown Bar which was the questionable peanut butter and bacon chocolate bar, however you will be pleased to know we are on more safer grounds with today’s review of salted caramel. 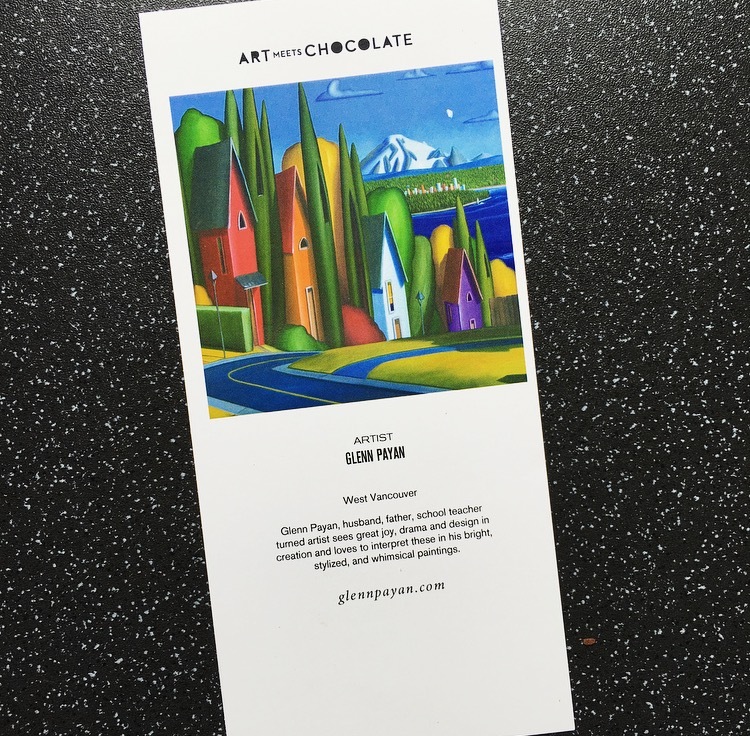 Created by an art loving Vancouver Chocolatier and using creative ingredients, Art Meets Chocolate are chocolate bars that are handcrafted in small batches using premium, organic and fair trade chocolate and locally sourced ingredients. What also separates these chocolate bars from others is the passion of art that is instilled within every creation. Like the previous bar this bar also has the resealable inner packaging and art card, this time by the local artist Glenn Payan. These cards are such a unique touch and really bring a personal approach to the handcrafted bar. Ooooh look at those grains of salt embedded into the bottom of the bar! I think we can check salt off the list. From first glance the colour of the chocolate would suggest it is more milk than dark but it certainly isn’t. The chocolate is beautifully rich, dark and bitter, just what excellent quality dark chocolate should be. The caramel flavour ribbons throughout the dark chocolate and provides a level of sweet buttery caramel throughout,which slightly lightens the dark chocolate. The salt was certainly evident and packs a punch especially when I hit a cluster of salty grains, which could be a bit too much for some. As a whole this bar was delightful and certainly rich enough to only need a little bit to satisfy the cravings. 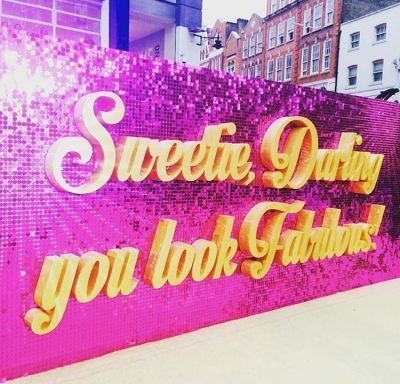 This Art Meets Chocolate bar is certainly the winner of the two. 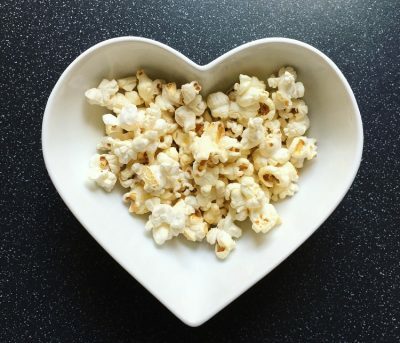 The quality and passion is above most and the flavours are spot on. 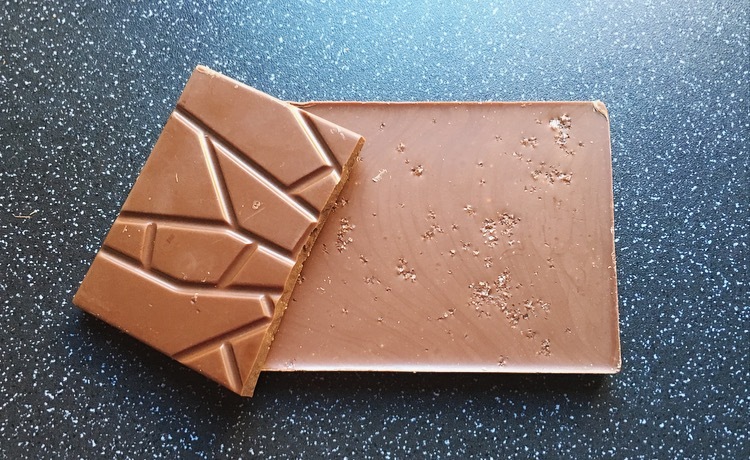 We need more decent salted caramel bars in the uk. They’re so hard to find!